It must be the hardware and the woven straps that made me stop and consider this pair of Troop ankle boots by Christian Louboutin. I usually prefer taller boots that don't cut my leg at the ankle and look better with dresses. Also, I'm a Manolo Blahnik girl, not a Louboutin fan for reasons that start with how comfortable Manolos feel and end with my preference not to be so obvious about my footwear. Then there's the 120mm heel (closer to 5 than to 4". At least it looks sturdy) that will make NYC pavements feel more dangerous than normal. 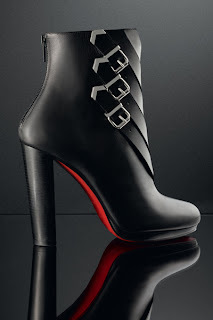 Yet there's something very wearable and attractive about these Louboutins, and dare I say practical? They're not peep-toes, a boot trend that needs to go away immediately, at least in areas that have real fall and winter. The zipper is in the back, looking like a stocking seam; I also like the round toe, but I wonder if the overall effect will make my big flat feet look bigger and flatter. 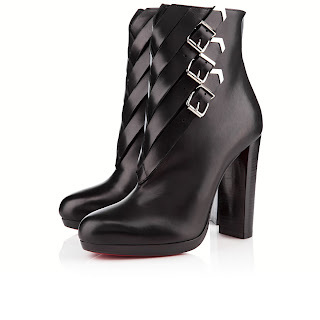 $1595 at Barneys and ChristianLouboutin.com. To be honest: they are stunning - BUT.. to be practical: I believe what makes them appealing to me is the newness of the leather, the smooth surface. I don't think they will be stunning anymore after being worn a few times with fine lines in the leather. Ooooooh, those ARE good. I am also not a Loubie gal - lately they've all looked like they're designed only for Kardashians and Russian mobsters' girlfriends, plus the last those dingdong things are built on is so narrow I often cannot get my foot into them. And you're right - that red sole has become the footwear equivalent of the LV monogram leather, and nothankyouplease to THAT. But those? Are pretty fantastic.